When our designer mixed European chic with Western preppy styling, we decided to call it “European Prep”. 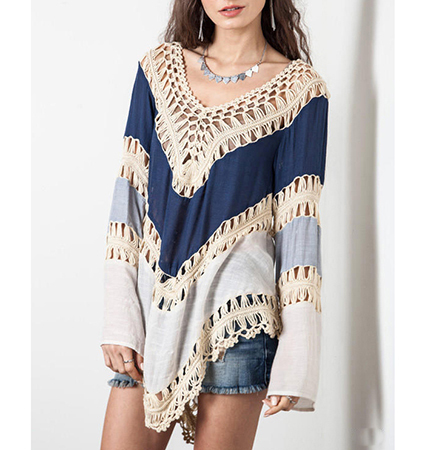 This charming chevron sweater combines a yoke of crocheted cotton in a fillet lace pattern and in other bands of fillet lace crochet placed between diagonal panels of colorful cotton. A low scooped neckline and three quarter length sleeves ending at the wrist complement a V shaped hemline. This European Prep pull over top is available in Bright Blue / Soft Blue, and Wintry White or Vivid Tomato, Glam Grey, and White. Pair this with faded skinny jeans or leggings and boots.